You may seen the story in the Catholic press the other day that four Nashville Dominican sisters began a band new mission in the Diocese of Aberdeen Scotland. Benedictine Bishop Hugh Gilbert preached the following brilliant homily. He touches on the great humanity of the current situation and also on the theological underpinnings of what’s going on today. His homily is touch on the Pentecost experience (the coming of the Holy Spirit), what the nature of vocation, church, sacrament, Christian witness, hope, evangelization is, and how these facets are life-giving. The Dominicans will be living at Greyfriars Convent in Elgin, a place found by the Franciscans in 1479. This latest Nashville Dominican venture adds to their mission in 19 US dioceses, plus Italy, Canada, Australia and now Scotland. At this point in their history, the Nashvilles boldly and yet humbly say that their numbers tally about 300 women. I’m old enough to remember Westerns. And here we are, wagons drawn close, feeling our last days have come and our scalps about to be removed, when – lo and behold – the US 7th Cavalry appears over the hill. Here they are, armed not with carbines but rosaries. And we can breathe again. Well, first of all, a building, this place, Greyfriars, is coming to life again. It was founded thirteen years before Columbus touched land in the Americas and is now coming back to life thanks to Americans. It has been most thoughtfully readied by Deacon Vincent, Fr James and others. And now it is resuming its original purpose. This is something that always lifts the spirits. 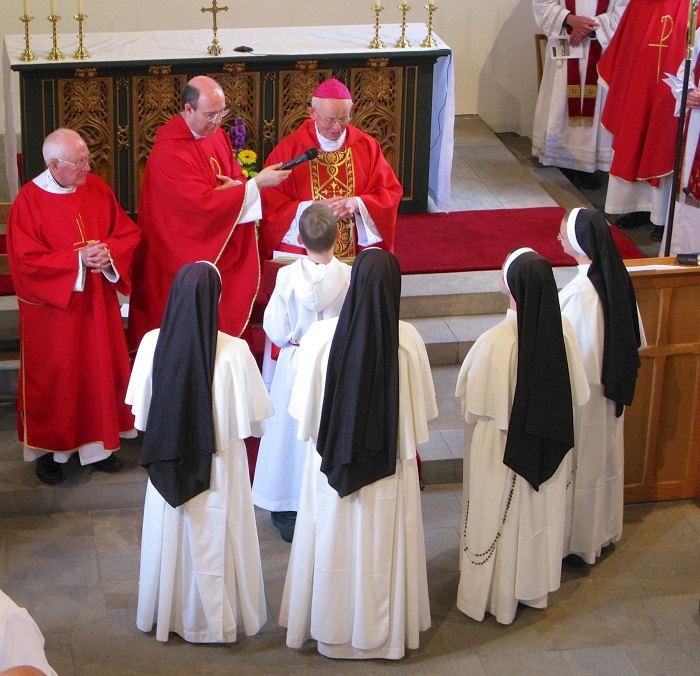 It has been the experience at Pluscarden, and twice now it has been the experience here – once in the 1890s thanks to the Marquis of Bute and the Sisters of Mercy, and now once more, after a few years of silence, thanks to the Dominican Sisters of St Cecilia. In a booklet about the parish of St Sylvester’s Elgin and St Columba’s, Lossiemouth, Fr Colin writes, ‘God is not in the business of letting people down.’ These revivals, resumptions, resurrections of holy places are a sign of that. ‘Yours is an everlasting kingdom’, said the Psalm, ‘your rule lasts from age to age’. Here let me tell a story. Last September I was at a course in Rome for new bishops. A new bishop from the States approached me. We have met before, he said. So it was. Before becoming bishop, he and another priest had visited Pluscarden, and I had met him then. He seemed to know the North of Scotland very well. It transpired he had friends among the Sisters of Mercy, in Dundee and here. I told him that the Sisters had now gone (as he knew) and (as he didn’t) that I had approached the Nashville Dominicans. Then he astonished me, ‘Do you know, ever since I heard that convent was empty I’ve been praying the Nashville Dominicans would fill it.’ And he went on, ‘If you want to re-evangelise Scotland, they’re the people who’ll do it. I’ll write to the Prioress General, tell her she must accept your invitation, and I’ll pay the fare over for one of the sisters.’ All of which he did. God seems to be in the business of answering prayers as well. So, at the back of today, there are the prayers of Edward Rice, Auxiliary Bishop of St Louis, Missouri. God bless him! And so on the feast of the Holy Rosary last year, the Prioress General, Mother Anne Marie Carlovic, and her Council flew in for a first visit. On the feast of St John Ogilvie this year, she and others flew in for a second. And on the feast of St Bernard, our US cavalry galloped over the hill, or more precisely descended from aeroplanes. Yes, today this place of prayer is coming alive again – alive with God’s People, God’s Word, with the Body and Blood of the risen Christ, with the Divine Office, private prayer. And what happens when that happens? It means we ‘see heaven opened and above the Son of Man, the angels of God ascending and descending.’ It means that Jacob’s ladder, with its busy angels, after lying on the ground gathering dust, is being set up again. Surely the angels are delighted. Surely the stones are glad. Surely those buried here are pleased. ‘You will see heaven open’, Jesus tells that first little group, the beloved disciple and Andrew, Peter, Philip and Nathaniel (Bartholomew). You will see what Jacob really saw in his vision, without realising it. You will see the Son of Man lifted up, lifted up on the Cross, as on the Cross of San Damiano above the rood screen. You will see the union of man and God remade, the house of God rebuilt. You will see ‘Jerusalem the holy city, coming down from God out of heaven.’ In a living house of prayer, under signs and symbols, in the humility of faith, all this is verified. Here Christ can gather up what’s in our hearts and lift it up to the Father. Here God’s blessing comes down into our lives. I think the sisters still await their internet connection. There’s a far more effective connection already in place. That is one thing happening today, from today. And here is another. 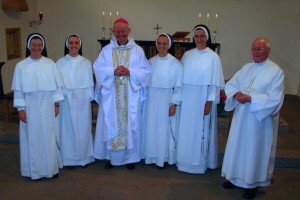 Sisters, thanks to you the religious life in this diocese is being enriched. And so we are all being enriched. By religious life, I mean the consecrated life, the life of those who profess the Gospel counsels of chastity, poverty and obedience, usually lived in community. In the Middle Ages, Elgin was full of such – Dominicans, Franciscans, the Cistercians at Kinloss, the Benedictines at Urquhart, the Valliscaulians at Pluscarden. It would be interesting to tell the history in the diocese since the 19th c. And certainly, we’re blessed for what we have now: the Sisters of the Sacred Heart and the Franciscan Missionaries of Mary, individual representatives of several congregations, the hermits, the Sons of the most Holy Redeemer and the brethren of Pluscarden. But would that there were more, may more! And it’s a very happy thing that now there are more. Four more, and not just four more. With you come your some 300 fellow-sisters, supporting you in thought and prayer. With you, Sisters, comes a whole tradition of holiness and spirituality. With you come St Dominic and Thomas Aquinas and Catherine of Siena and Meister Eckhart and John Tauler, and all the rest, a whole inspiration. We already have the monks, with antiquity on their side. We have disciples of the saints and founders of the 18th and 19th cc. But we have lacked the mendicants of medieval origin. And why is this coming a happy thing? Not just for those of us who are religious, but for all of us. The religious life, as history ancient and recent shows, is not all glory. Corruptio optimi pessima. But when it is good, it is very good. Every renewal of the Church has had a renewal of religious life at its heart. It is a barometer of the general state of the Church at any given time or place. I think a Church in which the consecrated life is weak or absent is like a Holy Trinity where the Holy Spirit is asleep. The Holy Spirit is the life and joy and generosity of God in person. He is the flowing love of the Father and the Son poured into one divine person. And so, as a created echo, is the consecrated life within the Church. It is all this in many human persons. There is a vision to suggest here. Through faith and baptism, all of us become sons and daughters of God in Christ, in the Son, the Second Person of the Trinity. We all become filial, Second Person-persons as it were. Then those who are ordained are given a share in the fatherhood of the First Person, the Father. And those who are consecrated somehow find themselves under the sign of the Third, the Holy Spirit. And the Holy Spirit is the Giver of Life, the Inspirer, the Comforter. He is from the Father and the Son and the Bond between them. And when the consecrated life is being lived by women or men with freshness and zeal, everyone – laity and clergy – is inspired and comforted, bonded and united. The Trinity is one, and the Church is one, and the different states of life flow in and out of one another, enhancing and enriching. Don’t we all feel this here and today? Isn’t it striking that such a small beginning can already have such an uplifting effect? That we already feel re-charged? I was wondering where in Dominican history there was a precedent for today. I have found one. One of St Dominic’s early foundations for nuns was in Rome, at San Sisto. Meanwhile, well to the north, in Bologna, a Lady Diana and some friends wanted to become Dominicans. We are in the 1220s. So Bl. Jordan of Saxony, St Dominic’s successor, pressed for four of the sisters in Rome to come north and help form this new community. Eventually Pope Honorius was persuaded to second the petition. He went to the convent in Rome to speak with the sisters. 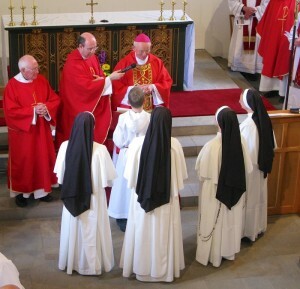 To quote the Chronicle: ‘the Pope said that he found it painful to drag any of them away from their monastery, but all the same it would be unfitting and improper to refuse to grant [such] a petition… So he commanded them, in virtue of the Holy Spirit and their vow of obedience, to choose four sisters who would be the most suitable to undertake this task, not forgetting that the eyes of God’s majesty were upon them. So four sisters, who had made profession in the hands of St Dominic and received the habit from him, came to the monastery of St Agnes [in Bologna] and remained in the community there until they died, mighty in the vigour of their holiness’. So Sisters, your four predecessors from Rome to Bologna, and you, another Dominican quartet, from Nashville and New Orleans and Baltimore, to Elgin. Coming ‘in virtue of the Holy Spirit and their vow of obedience’ – the Holy Spirit again. ‘Not forgetting that the eyes of God’s majesty were upon them’ – the God who loves you so much that he cannot keep his eyes off you. ‘Mighty in the vigour of their holiness’ – surely so! And those hands of St Dominic… Benedictines make profession before the altar (super altare), Dominicans in the hands of their superior (in manibus), and ultimately ‘in the hands of St Dominic.’ The eyes of God’s majesty and the hands of St Dominic – may they keep you! And as so often in Dominican iconography, may Mary wrap you in her cloak! A ‘sacrament of salvation’. It’s a very Vatican II phrase, found in the Council four times, I think. ‘Christ founded his Church as the sacrament of salvation’ (AG 5). She was ‘solemnly manifested as such’ at Pentecost (LG 59). ‘Lifted up from the earth, Christ has drawn all to himself; rising from the dead he has sent his life-giving Spirit on the disciples and through that Spirit has established his Body the Church as the universal sacrament of salvation; sitting at the Father’s right hand he is continually at work in the world, so as to lead human beings to the Church, joining them more closely with himself through her and nourishing then with his own Body and Blood making them sharers in his glorified life’ (LG 48). She is, then, ‘the universal sacrament of salvation’, ‘at once showing forth and putting into effect the mystery of God’s love for human beings’ (GS 45).